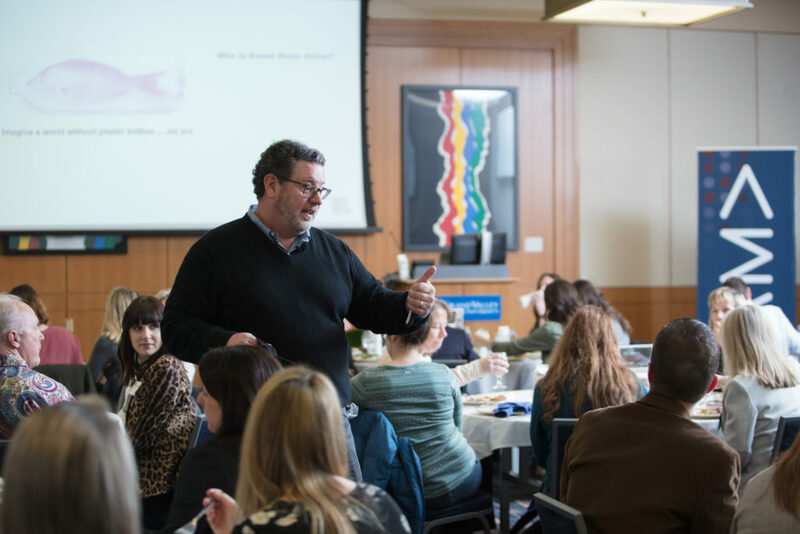 The team at AMA West Michigan was thrilled to welcome Rob Koenen, Chief Marketing Officer at Boxed Water, to be the presenter at the January 8th luncheon. Boxed Water, which was founded ten years ago in Michigan, is the first brand to offer a sustainable alternative to plastic bottles. They have been very successful in creating a deeper connection with their customers, becoming a conduit between consumers and their growing desire to help the planet. This relationship has elevated Boxed Water to much more than just a water brand. Rob, who was there to discuss cause marketing, started out his presentation by saying that there is, in fact, no such thing as cause marketing. His opening statement garnered a few confused looks from the crowd. He went on to explain that cause marketing is marketing, and not a subcategory. Marketing used to be all about brand image and solely focused on the product (think Coca Cola and the fuzzy polar bears), but in today’s world, company values are now what drive consumer connections. Rob explained that Patagonia has perfectly embodied the idea of putting brand values ahead of the product. Patagonia obviously has a great product to offer, but their marketing efforts instead focus on their preservation efforts. Because of their dedication to their cause, Patagonia even encourages consumers to repair their old jackets instead of buying new ones. Understand yourself and your consumer. Boxed Water picked the planet and sustainability, because it resonated with their personal values, but every brand is different and will find passion in different causes. Invest in a cause because you believe in the cause. At the end of the day, Boxed Water prioritizes saving the planet and creating a community that rallies around that same cause – rather than any “get rich quick” marketing campaign. Remember, it’s not a “campaign,” it’s a philosophy. The bottom line is that you need to be doing it because you believe in it. Find partners. Once you identify what you stand for, you will find partners across all brands and industries. People will find you. Use social media as your megaphone. The opportunities on social media are endless. Whether you are partnering with smaller brands for cross-promotion, doing giveaways, working with influencers, or posting unique ads, remember to be creative and strive for “thumb stopper” posts. Rob shared that Boxed Water would likely not exist if they hadn’t embraced their cause (preserving the planet) as who they are day in and day out. It would have failed if they only focused on their product, and not the why behind the product. Go back and sell (challenge) your leadership. Ask your team what they stand for and how you can align your company with those values. Understand yourself and your consumer. Whether it is focus groups or surveys, try to understand what makes your customers tick, and how your values can align with that. Make connections. Dedicate time to find people who align with your values and see how you can help one another. Amazing things can happen if you are persistent, positive, and nice. Leverage all connections. Everyone knows someone. Utilize your network or six degrees of separation in order to find people who will help further your brand story. Stop using single-use plastic. Thanks, Rob! Rob was dynamic in his presentation and gave insight that will be extremely valuable for all who attended the luncheon. 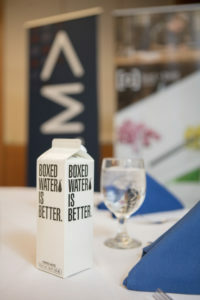 We are grateful to Boxed Water for providing fun giveaways and for giving us a glimpse into their wonderful company.